Natural Vitality is excited to announce its Kids Natural Calm Multi has been awarded Taste for Life’s 2015 Back-to-School Essentials Award. This is the second year in a row the editors of the publication have named the product a back-to-school essential. Kids Natural Calm Multi combines 24 organic fruits and vegetables along with omega-3 DHA & EPA, amino acids, magnesium and balanced calcium in an organic, fruity liquid that is naturally sweetened with organic stevia. The product is recommended for kids ages 4 through 13. 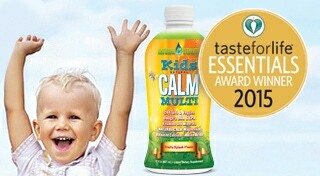 In past years, Kids Natural Calm Multi has also received a Delicious Living Supplement Award, and is a recommended product by Mommy MD Guides as well as being Ashley Koff Approved.